GHBLP Internal Internet access and email is down. If you need immediate assistance, please call 616-846-6250 to speak with one of our Customer Account Representatives. We apologize for any inconvenience. Thank you for your patience during our external phone line issue. Our provider has reported the problem has been resolved. If you need any assistance please call Customer Service at 616-846-6250 or contact us by email at customerservice@ghblp.org. We are experiencing external phone line issues. At this time our phone provider has not provided an estimated restoration time. 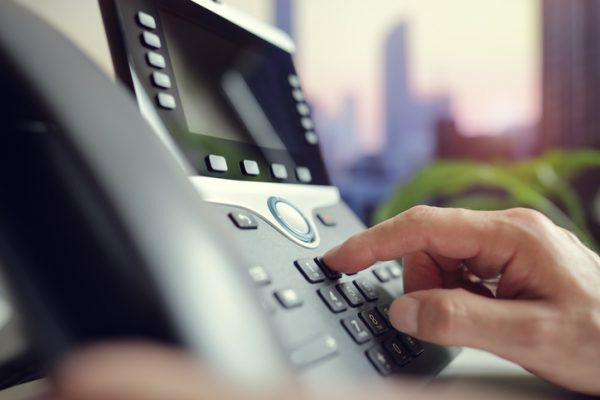 If you need to contact us immediately email us customerservice@ghblp.org or visit us at our Service Center 1700 Eaton Drive. Thank you for your understanding during this phone line outage. High Winds Expected throughout the day! Fox News released an updated weather report about the high winds warning and blizzard conditions. Wednesday, February 6, 2019, Grand Haven– The Board of Light & Power’s J.B. Sims Generating Station on Harbor Island was taken offline the evening of Tuesday, February 5, 2019 at 9:26 PM due to a piping failure. Grand Haven’s snowmelt system heat is currently being supplied by the plant’s auxiliary boiler. Wednesday, February 6, 2019, Grand Haven– Freezing rain and ice was the cause of power outages to Board of Light & Power customers beginning in the early hours of the morning on February 6, 2019. The first reported outage affected 808 customers at 1:51 AM in the West Spring Lake Road area north to Hemlock. Power was restored to all by 8:04 AM. This area lost power again at 8:11 AM with power restored at 9:21 AM. At 2:46 AM, 2,195 customers lost power in the City of Grand Haven from North Harbor to Colfax and east to Beechtree Street. Power was restored to these customers at 7:30 AM. At 4:47 AM, 1,042 customers lost power in the City of Grand Haven from Colfax south to Robbins Road. Power was restored at 7:06 AM. All outages were due to fallen trees or limbs on the lines. A few scattered outages remain, affecting 1-2 customers at a time. Crews are working to restore power to these customers as safely and quickly as possible. We appreciate everyone’s patience as our crews work to safely restore power. We would like to remind customers to report power outages in the BLP’s Outage Center, which is on our website at ghblp.org, or by calling 616-846-6250. 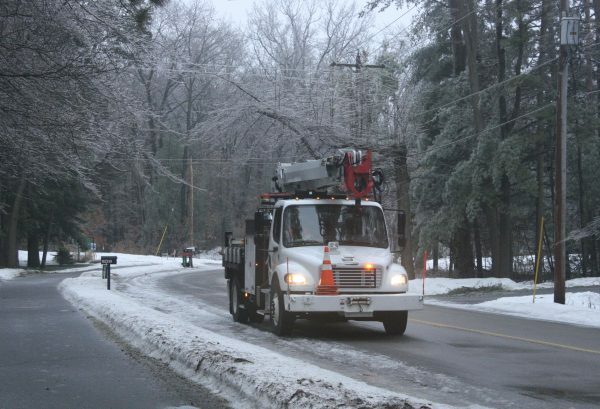 Freezing rain and ice have caused power outages throughout the GHBLP system. BLP crews have been working since the early morning hours to restore power throughout the area. A few scattered outages remain in the Grand Haven area. At 8:07 am, West Spring Lake Road customers from Ferrysburg to 168th lost power and crews are currently working to locate the cause. 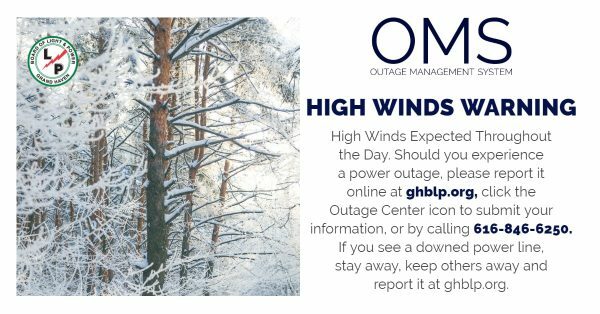 If you lose power, please report your location at ghblp.org on the Outage Center icon or call 616-846-6250. Thank you for your patience as we work to restore power to all customers. Please be aware that on Monday, January 28, 2019, beginning at 10:00 am, the Board of Light & Power’s Outage Management System is scheduled for upgrades. The OMS system will not be available to report an outage or service issue during the upgrade, which will take between 60-90 minutes to complete. Thank you for your patience and understanding as we work to upgrade the OMS.